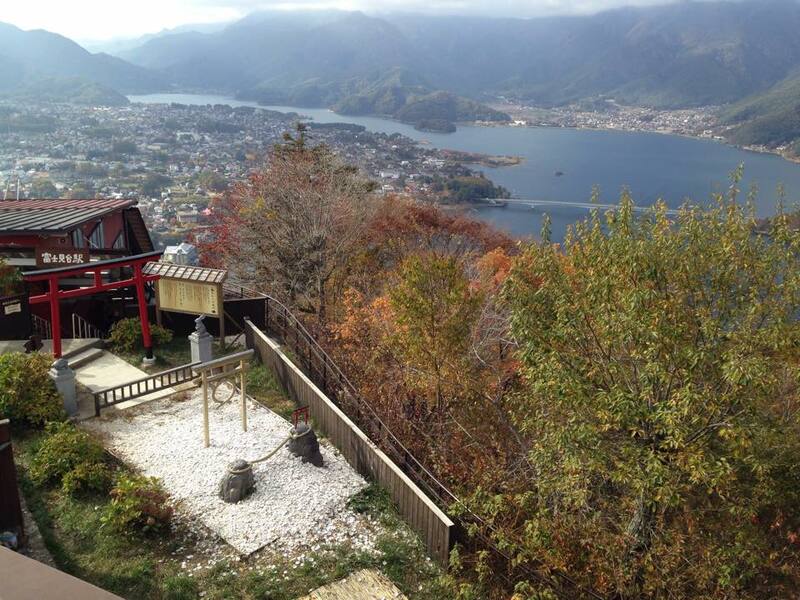 Above: Kawaguchiko – from the other side of the lake, the view of Mt Fuji is meant to be spectacular. We were unlucky with the weather and Fujisan was hidden behind clouds the whole day. As such, we didn’t bother going to the other side since we would only have seen the spectacular view of the clouds covering the mountain. The town of Kawaguchi was very quiet on the day that we visited. It was a Thursday, and most of the shops near the base of Mt Tenjo were closed. There weren’t many options when it came to finding something to eat for lunch, so we settled for a restaurant on top of one of several souvenir shops, which boasted an English menu. 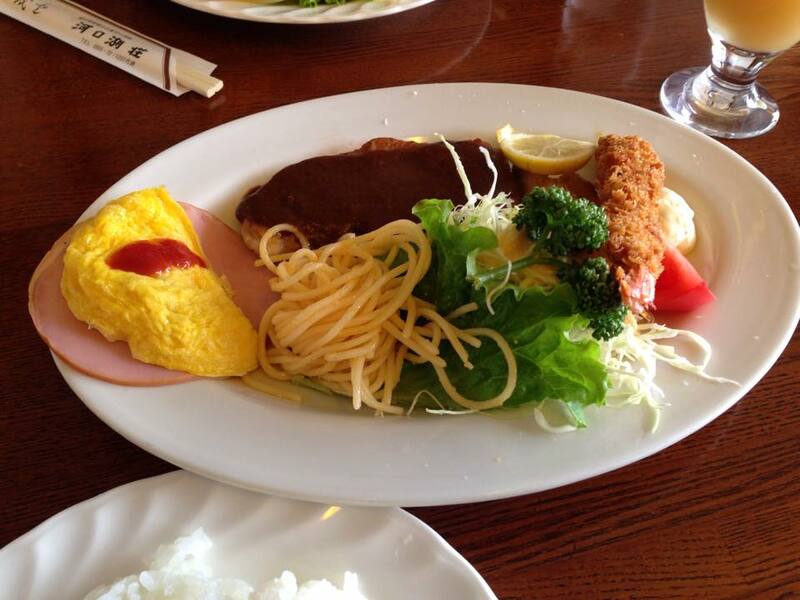 It’s rare that we’re disappointed by a meal in Japan, but this was a disappointing lunch. In an attempt at viewing Mt Fuji, we took the Mt. Kachi Kachi Ropeway up to Mount Tenjo. Mt. Kachi Kachi Ropeway, often called the Kachi Kachi Yama Ropeway, is a cable car which takes you up toward the top of Mt Tenjo, a location with spectacular views of Mt Fuji and the surrounding area. 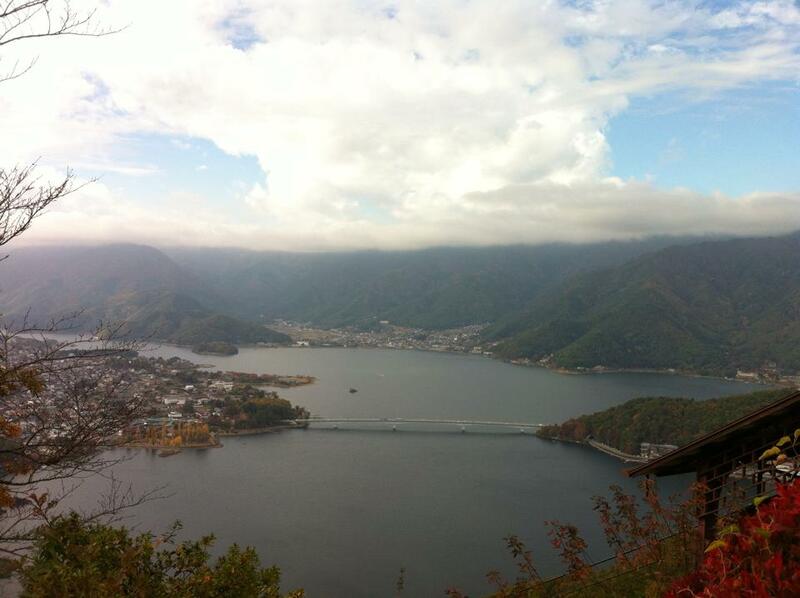 Its official name is the Lake Kawaguchi Mt. Tenjo Ropeway (河口湖天上山ロープウェイ). The cable car journey takes about three minutes and runs every 5-10 minutes from 9am (9:30am in winter) to 5:10pm (4:40pm in winter). It is open every day of the year, providing that the weather is okay. 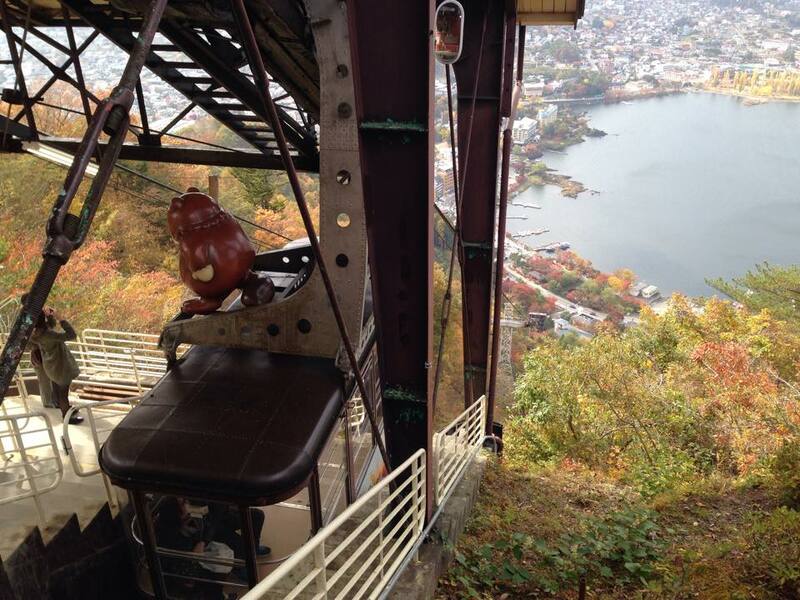 The ropeway costs 410 Yen one way or 720 Yen for a return trip for an adult. 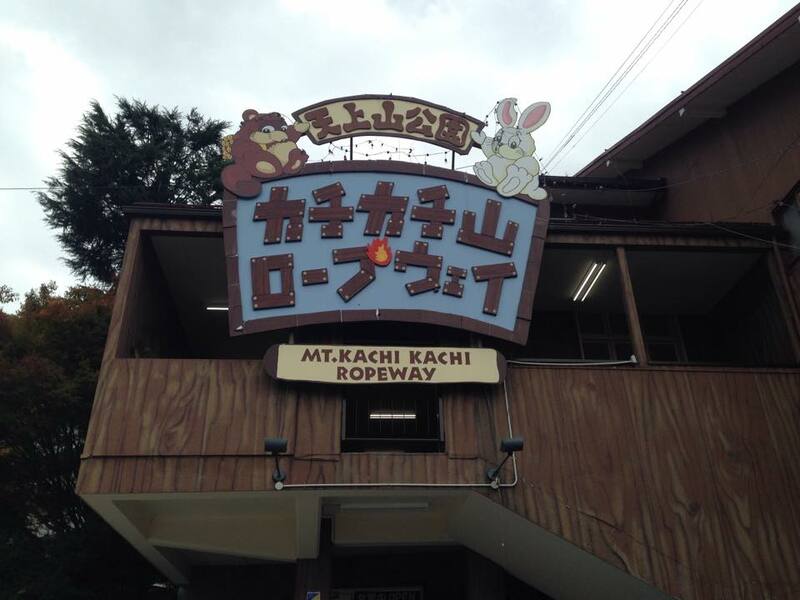 Children, groups of 15 or more and people with disabilities pay lower prices, which can be found on the Kachi Kachi Yama Ropeway website. If you’re not comfortable riding in cable cars, you don’t like the sound of being squashed into one with way too many people, or you’d rather get some exercise whilst enjoying a scenic hike up to the top, you can also walk. The hike is meant to take around 40 minutes. Once you reach Mt. Tenjo, there are several activities, as well as some snacks. 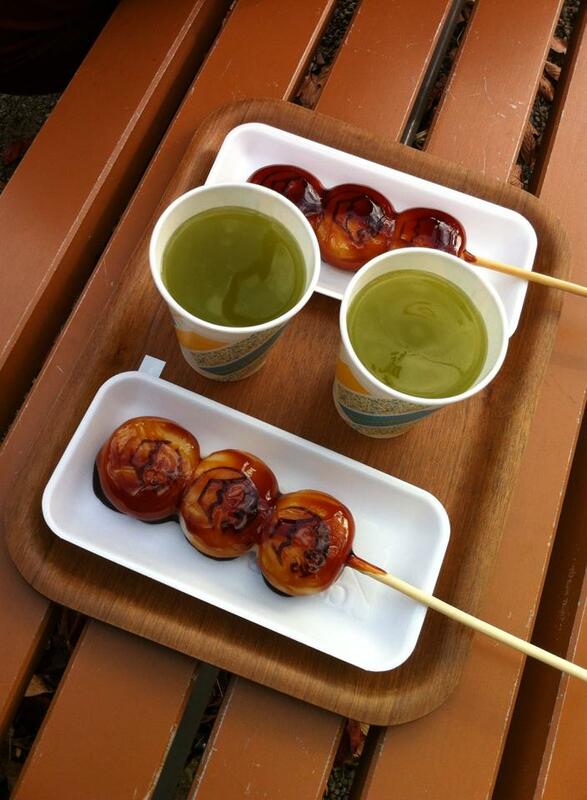 Fujisan Mitarashi Dango (みたらし団子、御手洗団子) are coal roasted Japanese rice flour dumplings on a stick with sweet soy glaze. I’d describe these as large, roast, unsweetened mochi with a thick sweet and salty soy sauce. These are sold for 320 Yen (for a stick with three dumplings) at the shop on the top of Mt Tenjo named Tanuki Tea House, where they also call them Tanuki Dango. Tanuki is the Japanese raccoon dog – but don’t worry, the dumplings are not made of raccoon dog – there is no meat or filling of any kind in the Mitarashi Dango. Kawarake-nage, or Kawarake throwing, is pottery throwing activity. 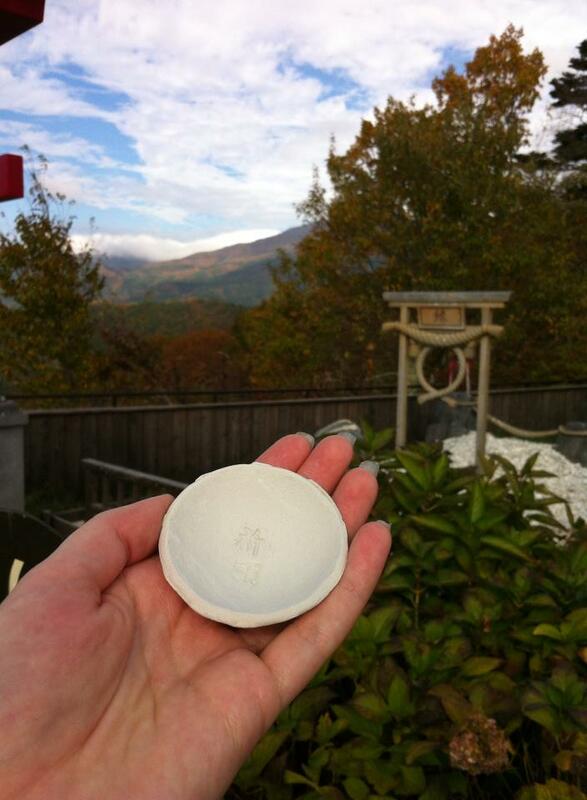 The small clay discs can be purchased just outside the Tanuki Tea House at 100 Yen for two, and thrown through a rope under a wooden gate. This is meant to ward off evil. Above: scoring a goal and/or obtaining protection from evil. The Bell of Tenjo (which I don’t seem to have a photo of) is a large bell suspended in a large steel heart-shaped frame. Ringing the bell is tied into a few ideas, from health to fulfilling love. 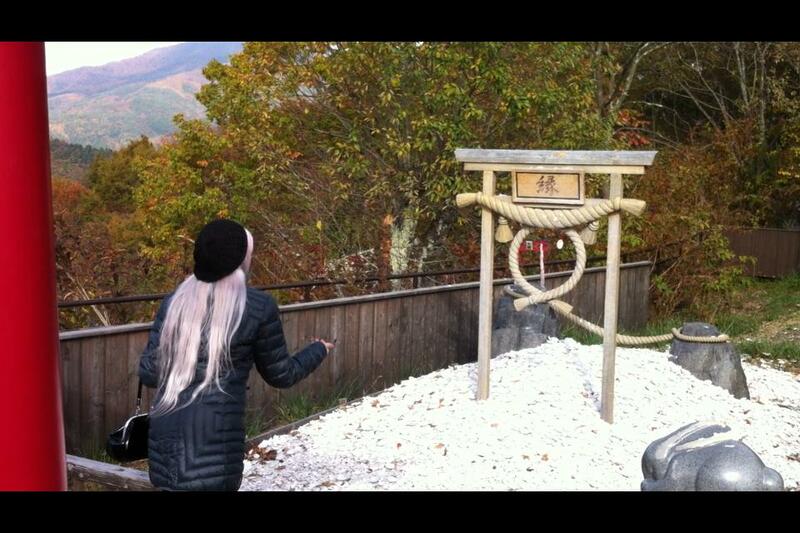 It is also said that if you ring the bell whilst watching Mt Fuji, your wish will come true. We couldn’t see Mt Fuji thanks to the clouds. My wish – which was to see Mt Fuji – was not granted. Above: We stared at these clouds for a good 45 minutes. Fujisan was hiding behind them the entire time that we were in the region. 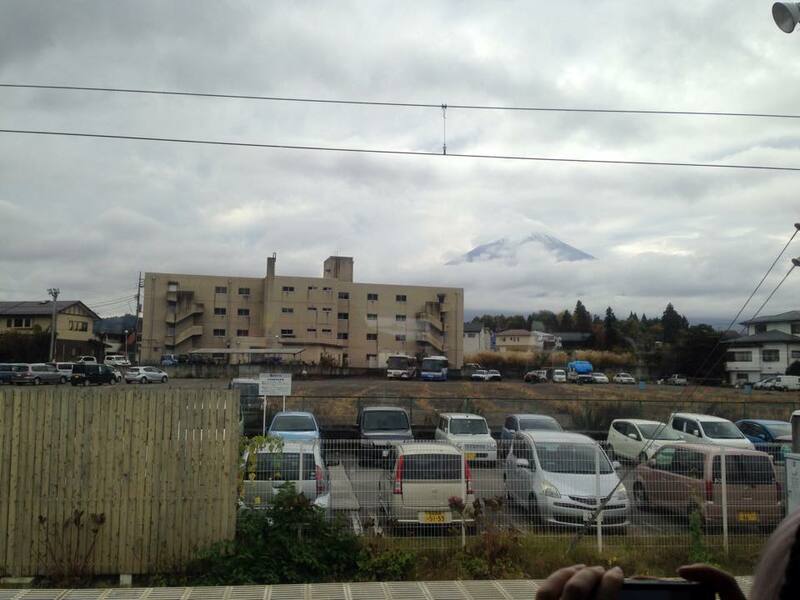 Above: Our best view of Mount Fuji, captured on the train on our way to attempt to see it. We hope to have better luck next time! 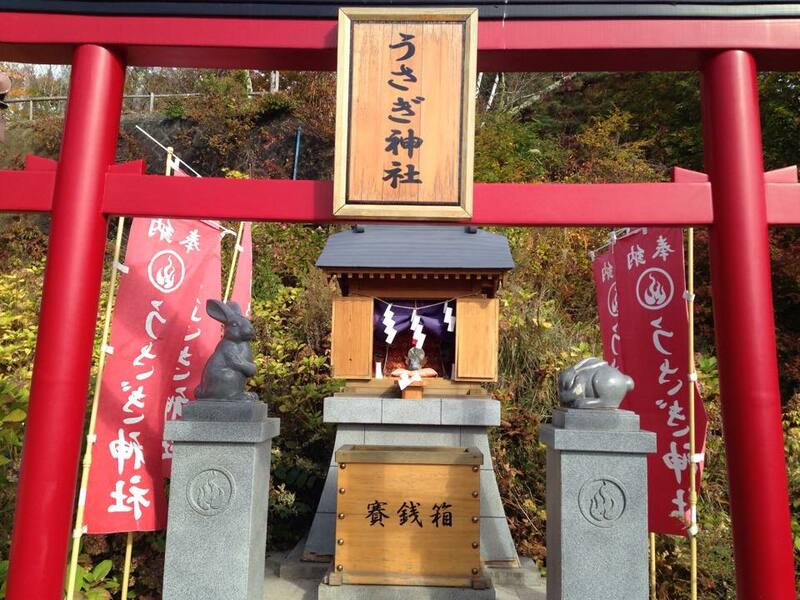 Usagi Shrine is just past the Tanuki Tea House, and is dedicated to the rabbit form the story of Kachi Kachi Yama. What’s the connection between Mt Tenjo and the story of Kachi Kachi Yama? 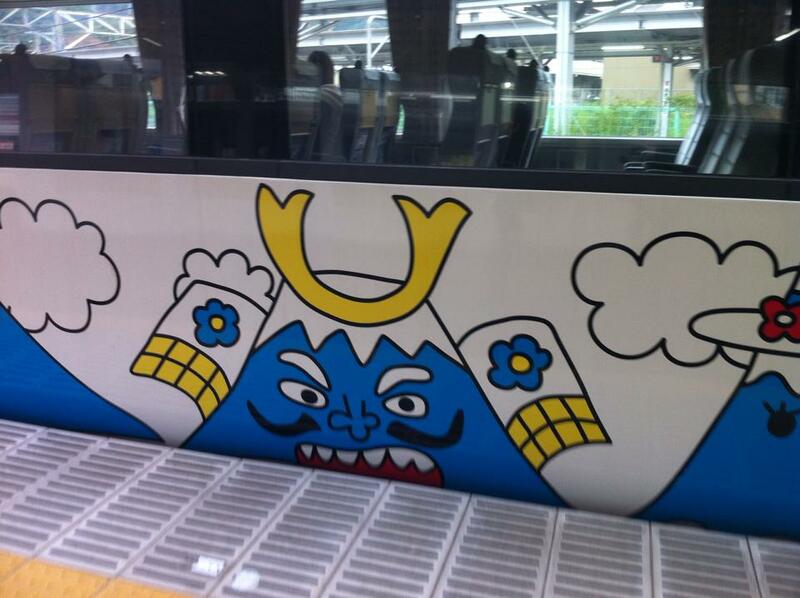 The story of Kachi Kachi Yama (かちかち山), or Kachi-Kachi Mountain, is a Japanese folk tale. It starts with an old man and woman who lived together. They’d sown some seeds on the mountain, and then discovered that a tanuki – a Japanese raccoon dog – had eaten the seeds. They set a trap and caught the tanuki, but forgave him when he apologised for eating the seeds. The tanuki ended up killing the wife, and a rabbit who was friends with the elderly couple promised to avenge them. The rabbit accompanied the tanuki on a trip to the mountain to gather firewood, and on the way back, set fire to the wood in the tanuki’s backpack, burning his back. The rabbit initially told the tanuki that the sound that he could hear, “kachi kachi” (the sound of the firewood crackling as it burned), was coming from Mount Kachi Kachi. The next day they went to the river. The rabbit’s boat was made of wood and the tanuki’s boat was made of mud and sank, drowning the tanuki. Mount Tenjo is meant to be the mountain in which the story is set, and is thus the site of Kachi Kachi Yama (Mount Kachi Kachi). This explains all the statues of the rabbit and racoon dog found on the cable car and on Mt Tenjo, and the reason that Usagi Shrine is found there. 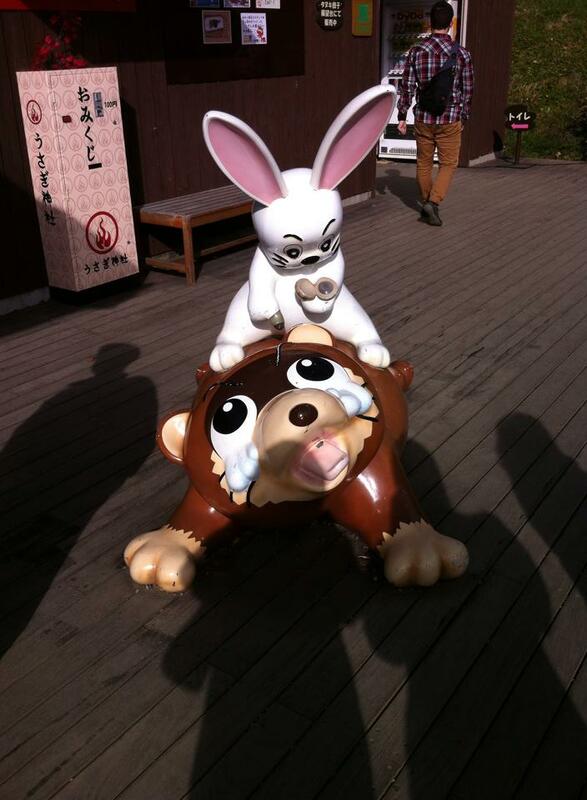 You can even pose for a photo in front of the tanuki and rabbit mascots, with Mt Fuji in the background. You can get a print of the photo for free in which half of the photo has a picture of Mt Fuji (or how it should look on a fine day) with a little photo of yourself in the bottom corner, or you can pay 1,000 Yen for a full size print of yourself with the mascots. We opted for the free version. Above: Unaware of the tale of Kachi Kachi Yama, we weren’t sure what was going on with these mascots, but we thought this one was pretty funny. It makes a lot more sense now that we know the story! 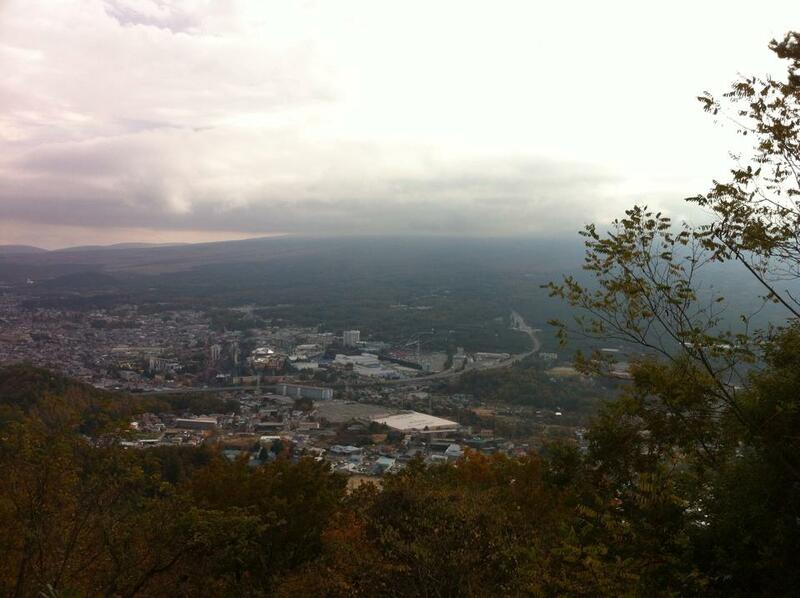 I had read that Aokigahara (青木ヶ原), also known as the Sea of Trees (樹海) or the Suicide Forest, could be seen from Mt Tenjo. There is a map on Mt. Tenjo which indicates where it is, but I’m not convinced that it can actually be seen. I understand that Aokigahara is a bit of a sensitive subject with locals now that it is famous as a suicide location for more than a hundred people each year, so I didn’t attempt to ask whether the Sea of Trees could really be seen from there. 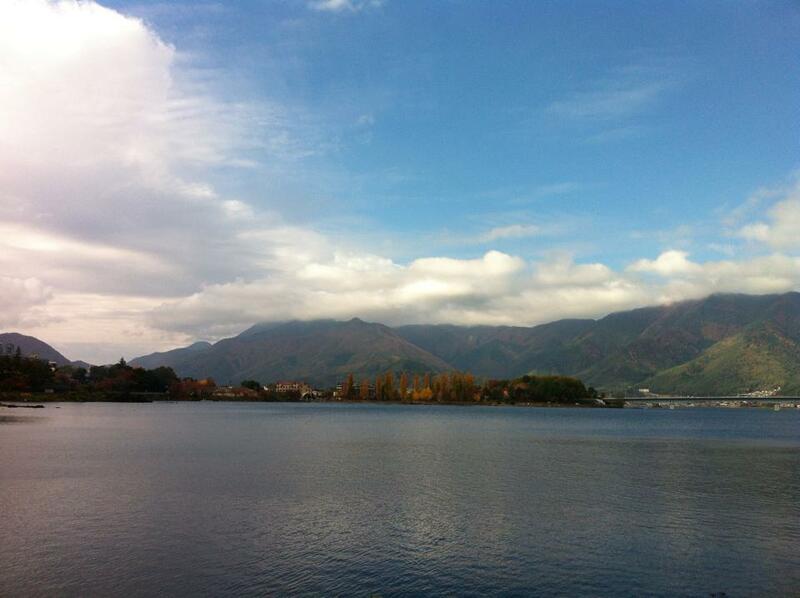 It can, however, be seen from one of the other lakes, Saiko (yep, that’s pronounced ‘psycho’!). 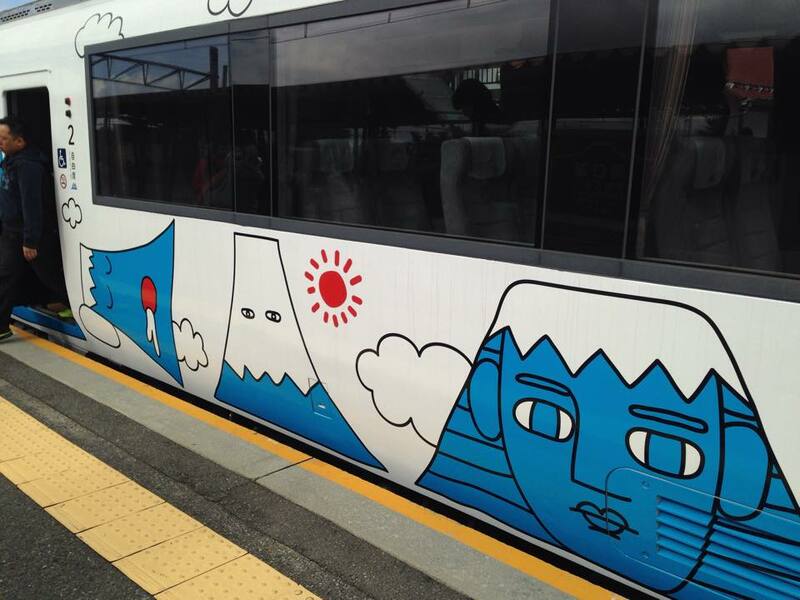 Above: Cartoon-like images of Mt Fuji decorate the trains on the Fujiyoku Line. 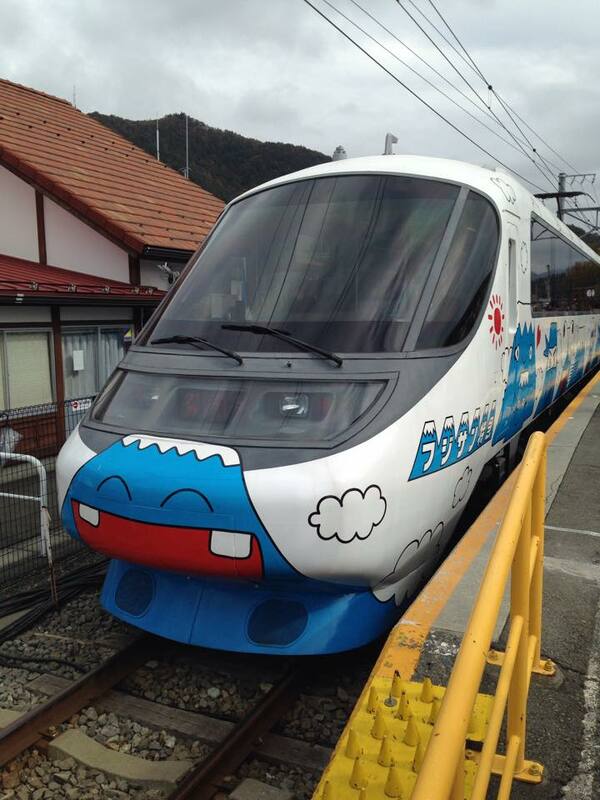 We travelled via train to and from the Fuji Five Lakes region. Coming from Shibuya, it was a JR train to Shinjuku, then a JR Chuo Main Line limited express to Otsuki station (over an hours), then a change to the Fujiyuko Line to Kawaguchiko Station. This is said to take around two hours, but it took us a little longer. I think we spent around 6 hours travelling to and from the area that day. Once we got there, we hopped on a Retro Bus (the tourist bus in the area) to get to the foot of Mount Tenjo. We attempted to visit Mt Tenjo and view Mt Fuji, and to explore Fuji-Q Highland theme park (where we had a great time at the Evangelion: World exhibit) all in a space of a few hours on a day trip from Tokyo. This meant that we spent much of the day trip on the train (not the fastest way to get there – if you make a reservation in advance, there’s a bus that is meant to take a little under two hours from Shinjuku Station). We didn’t get to spend as much time at Fuji-Q Highland as we would have liked. If you’re planning to do more than one activity in the Fuji Five Lakes region, I would recommend staying nearby. Next time we’ll definitely be spending at least one night in a hotel somewhere in the region. Apparently you’re more likely to see Mt Fuji without the cloud first thing in the morning, so that’s another reason to consider staying nearby! For those who want to do a day trip, if your itinerary is flexible enough, aim to visit the area on a fine and sunny day when Fujisan is less likely to be hidden behind clouds. Our itineraries are usually so packed that we don’t always have the flexibility to do this, hence we were out of luck on the day we visited.